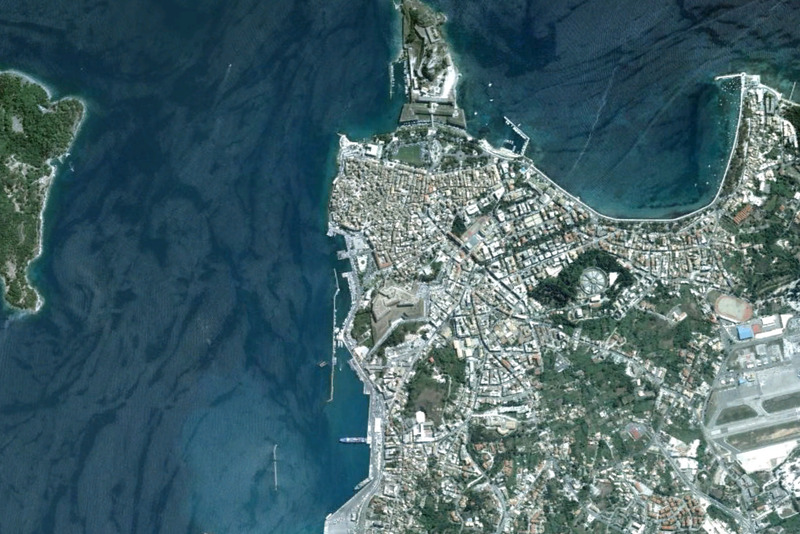 In August 2009 the historian Diana Gilliland Wright wrote in her blog, "Surprised by Time" of her discovery near Nauplion of, "a wall behind the bed of a winter stream, with cannon embrasures... The stonework looks a lot like the embrasures on the fortress of Palamidi." Putting this observation together with a study of Venetian maps of their 1686 conquest she noticed similarities on the ground and from the air, courtesy of Google Earth, to the zig-zag trace of these 'temporary' field works. Pending further study on the ground comparing the trace on the map with the lines of field boundaries and the like further to the east an intriguing pattern emerges although all archaeologists are painfully aware of how easy it is to draw lines on a map and imagine they mean something. Of course these details can only be checked on the ground but this all poses the question of what other remains of outworks and siege lines are preserved around the eastern Mediterranean. There were after all a number of sieges undertaken on a huge scale and one might expect therefore some traces to remain on the ground, after all it is hard to completely erase something from the archaeological record. The difficulties are, however, severe. There is a natural tendency for such works to be quickly leveled and back filled, as Peter Harrington remarks (English Civil War Archaeology, English Heritage 2004), "After a place had been captured the siege works were often slighted in order to remove any potential cover to a would-be attacker... A likely adjunct to war-time slighting was the removal of such signs of war after the peace in order to return the landscape to an appearance of normality." Add to this the need to press agricultural land back into service and suburban developments, particularly in the last fifty years and the problems of survival become formidable. However, given the fact that many of the sieges are well documented and some very useful period maps and illustrations survive it is worth pointing out where options for further investigations exist. 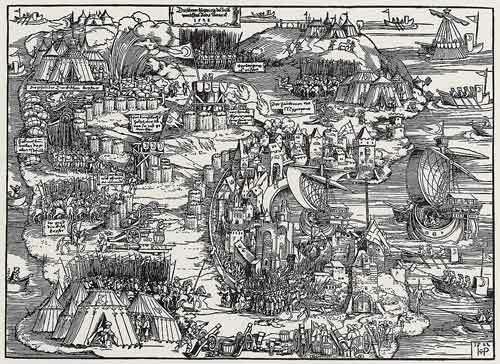 In 1685 the Doge of Venice Francesco Morosini mounted a siege in order to re-establish Venetian control over the area. 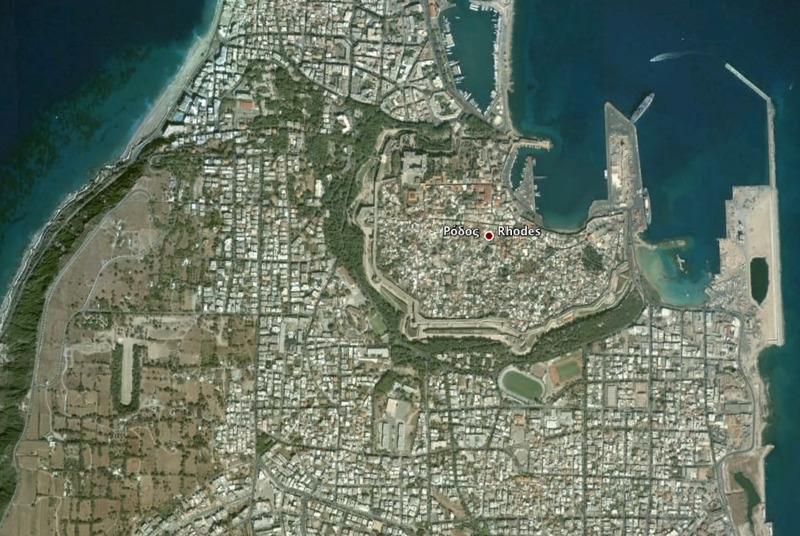 He landed to the west of the town and constructed a line of cirumvallation to prevent relief coming from the Ottoman army based at Kalamata. This is clearly shown on period maps. Both maps indicate a double line of works with the eastern most having two or three wedge shaped projections to the west and the western most having rectangular projections with a square redoubt towards the south coast. In addition there is clearly some kind of redoubt on the hill overlooking the harbour to the north and linear works connecting it to the northern shore. To the north west are shown on one of the maps Turkish lines which must have made use of the north scarp of the valley running in a north easterly direction. The hill beyond that to the west looks worth investigating for possible defensive works: either connected to the siege or potentially earlier. Only detailed examination on the ground will tell. 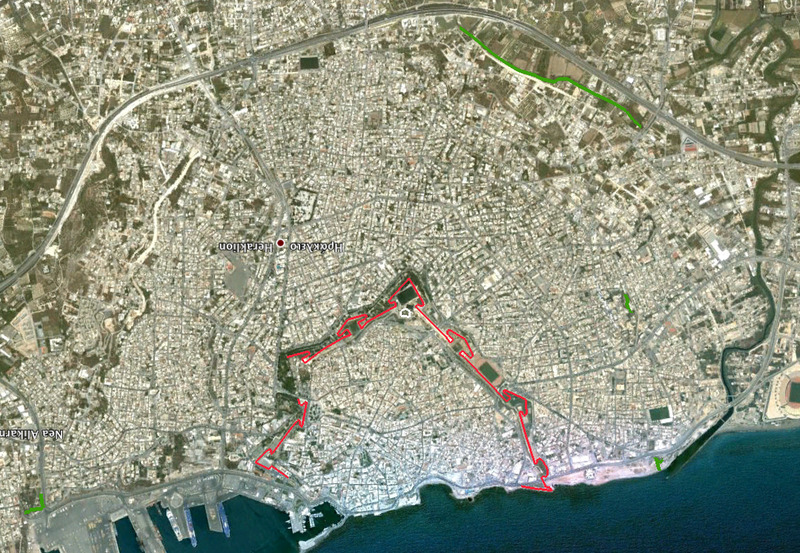 One of the lengthiest sieges recorded in the area was that of Heraklion on the island of Crete which ran for twenty years or so until 1669. A very detailed map of the siege charts the extent of the Turkish siege works. Unfortunately the outskirts of the walled city are now very heavily built up, However, there are a few locations which could repay inspection as they offer patches of open ground with some indications on the aerial view of surviving earthworks. 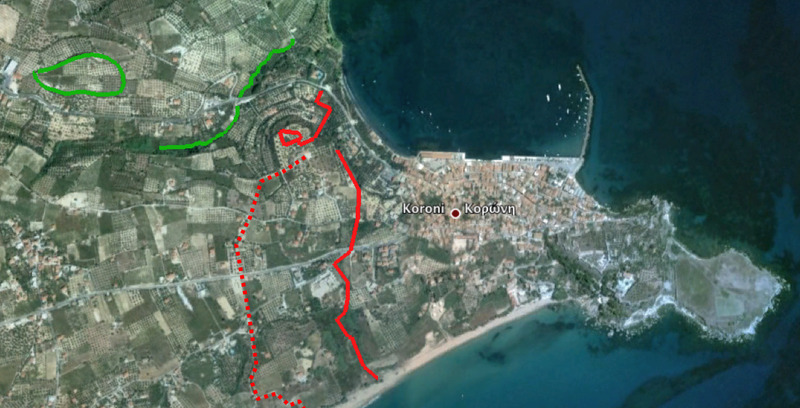 The Turkish lines lay mainly to the west (to the right on map and aerial photograph), traces of these may remain. there was also a defended Turkish camp on a low hill to the east (to the left on map and aerial photograph) which may again be available for examination. 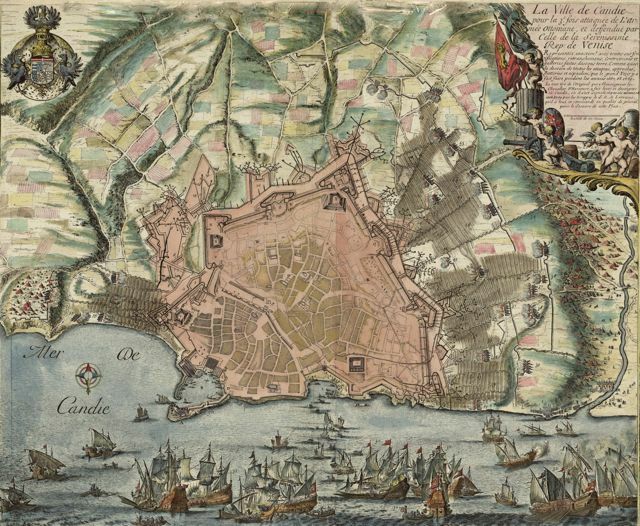 The Turkish siege of the city began in October 1570, when camp was made at the village of Pomodamo, nearly 5 kilometres to the south of the city. After over-wintering in camp Turkish forces began by constructing batteries on a front of 1,000 paces on the south side of the fortress. 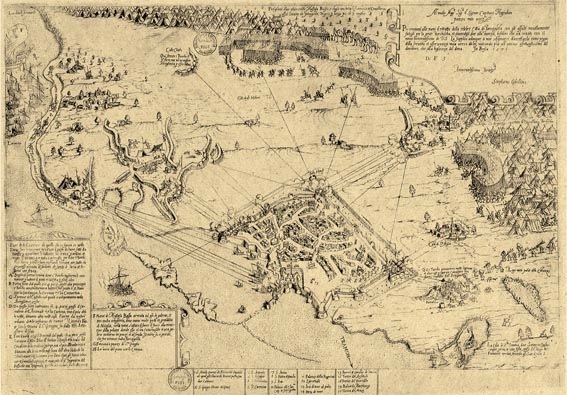 Subsequent works were erected to the west and operations continued until the Venetians surrendered on August 1st. 1571. 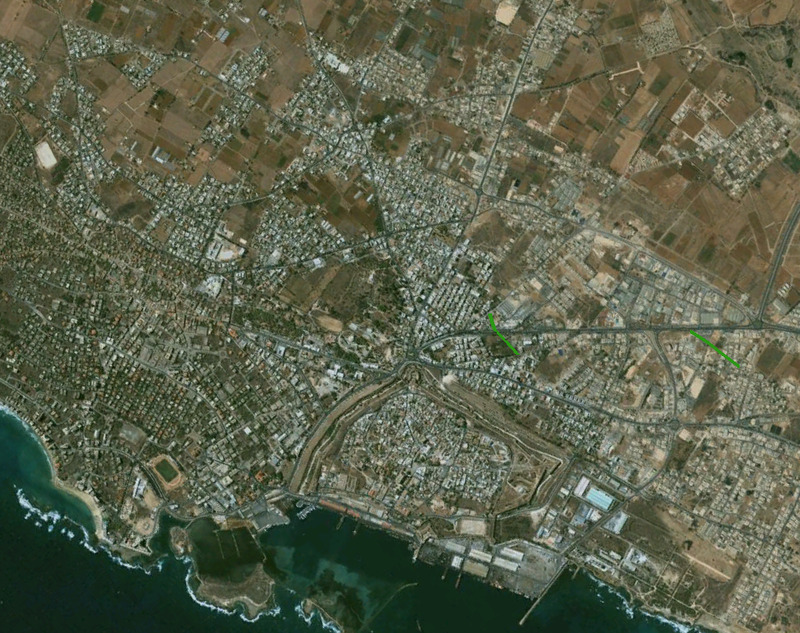 Following the partition of the island in 1974 there has been little development in the immediate vicinity of the town. There is some open ground to the south and west and aerial photographs show some curious alignments which could be worth looking at. Contemporary map and aerial view from NE, green lines show possible earthworks. 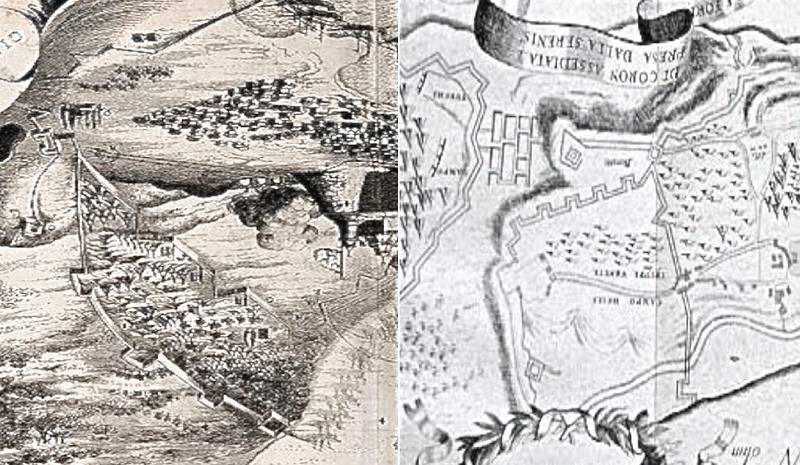 The city, occupied by the Knights of St. John, was subject to two Turkish sieges, the first unsuccessful in 1480 and the second, successful in 1522. the immediate environs of the old city are heavily built up but it is clear from contemporary illustrations that that there was a considerable network of batteries and camp sites although the images do suggest that extensive use was made of gabions which would leave little trace on the ground. It might be profitable to explore the heights of Monte Smith to the west for relevant archaeology. 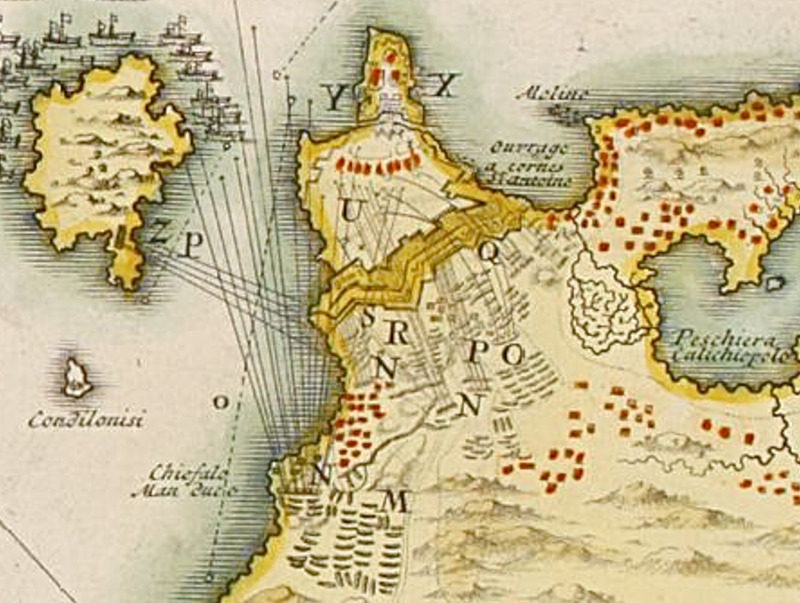 One of the last sieges in the region, Corfu was attacked by Turkish forces for the third time in 1716 when batteries were built to assault the town all along the land front which faces north west. The attack was beaten off after 22 days. Although built up the density of construction along this side of town is quite light and it is possible that something could remain in gardens and other open spaces. It would be nice to go and see... perhaps next year.